In this week’s podcast, we packed up our carpet bag and headed northeast to check out the race in New Hampshire with Los Angeles Times reporter Maeve Reston. If Scott Brown wins the GOP primary there next month, it will be the third time he’s been the Republican nominee for the Senate. It’ll also be the third time his opponent will be a woman. In 2010, he defeated Martha Coakley in Massachusetts, in 2012 he lost to Elizabeth Warren, and this year, he would face New Hampshire Democratic incumbent Jeanne Shaheen. This week’s question is: who is the most recent senator to run against female opponents three times? Last week’s trivia question was: before Jim Jeffords’ party switch in 2001, when was the last time the Senate went from having more Republicans to having more Democrats without the benefit of an election? The answer: 1953. 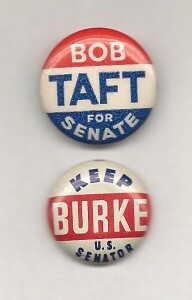 Ohio Republican Senator Robert Taft, the Senate Majority Leader, died of cancer. The Democratic governor, Frank Lausche, named Cleveland Mayor Thomas Burke, a fellow Democrat, to succeed Taft. That moved the Senate from 48 Republicans, 47 Democrats and 1 independent, to 48 Democrats, 47 Republicans, and the one independent. The randomly selected winner this week is Ron Merlo of Glendale, California. He gets the coveted Political Junkie button! Congrats, Ron.